The Electrodyne 2501 is a dual mono pair of two stage discrete transistor, transformer coupled preamp with active DI, using classic early ’70s design technology. Each amp stage is individually optimized for peak performance using Electrodyne factory engineering notes and selected high performance components identical to the originals. The transformers are made by Electrodyne’s original manufacturer to exacting factory specifications. The active DI circuit presents an almost immeasurable load to sensitive musical instrument outputs allowing incredibly accurate capture of the instruments true tone. 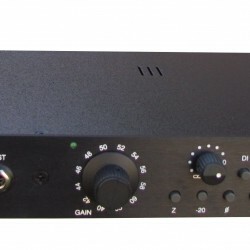 The output of the DI circuit is designed to directly connect and interact with the mic input transformer to allow maximum tone options. Distortion: 0.02% typical over entire gain range. Frequency response: ±0.25db, 10hz to 60khz.